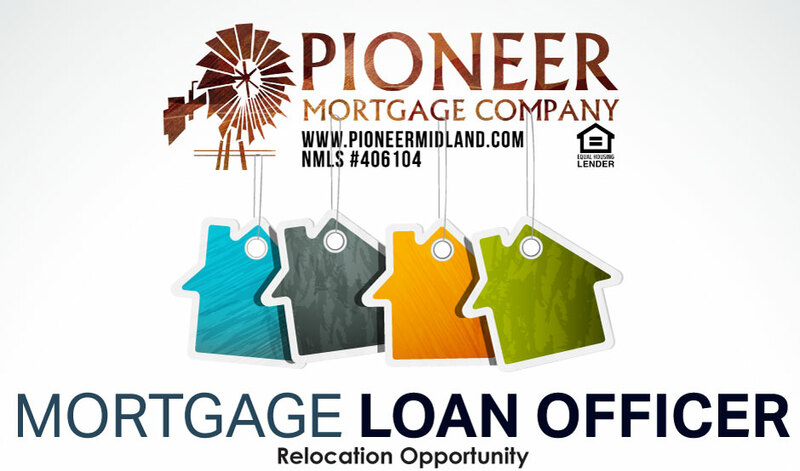 Pioneer Mortgage Company is ready to relocate a career minded mortgage loan originator to join our well established Midland Texas office. A book of business is not necessary for success in this position. The bank offers a relocation and non-recoverable draw package. An ongoing flow of quality local inquiries from bank customers, real estate professionals and response to marketing are available ― enough time to establish a pipeline with momentum before transitioning to salary against uncapped commissions. For nearly forty years, Pioneer Mortgage Company has maintained a reputation as a go to lender among Midland area realtors and builders. The bank’s investment in relocation and development for this position are predicated upon demonstrating a mature level of knowledge, experience and integrity for conducting face to face business. In kind, the ideal candidate can look forward to working with other experienced and successful loan officers in a supportive environment, with a non-competing Branch Manager. Midland is known as the economic and financial center of West Texas. Situated in the Permian Basin, one of the largest crude oil development regions in North America ― Midland residents enjoy an unparalleled level of opportunity. The average purchase price in March was $260,127, among the highest in Texas and surrounding states. Midland’s rate of unemployment was recently reported at 2.9%, one of the lowest in America. Pioneer Mortgage Company, a subsidiary of Pioneer Bank is a regional lender serving Texas, New Mexico & Colorado. Their residential lending, from interim construction to conventional, government and portfolio jumbos for luxury homes are all locally hand crafted and serviced in house for life. Your purchase business will excel with unsurpassed local support and direct access to final decision makers for which Pioneer Mortgage is known. Demand from existing customers are always strong when market rates are low because this bank services everything they close. Operating as a private, independent bank since 1901, generations of home buyers and their real estate partners have prospered from an unwavering commitment to accommodating their individual needs and circumstances. Right now is your best opportunity to join and prosper with Pioneer Mortgage in Midland Texas. Develop and execute a plan for repeat and referral business. Obtain information, present solutions and establish appropriate expectations about the process with applicants. Produce complete, accurate and compliant applications for processing. Work all transactions through close to ensure customer deadlines are meet. Possess two or more years of residential mortgage origination and or loan processing experience since 2010. Be SAFE Act compliant. Clear the background process and ready for NMLS sponsorship. Individual licensing is not required. High school diploma, BA or higher. Pioneer Bank is an equal opportunity employer. A full complement of employee benefits are available. Tags: loan officer, midland, mortgage, relocate, texas. Bookmark the permalink.